hey there! 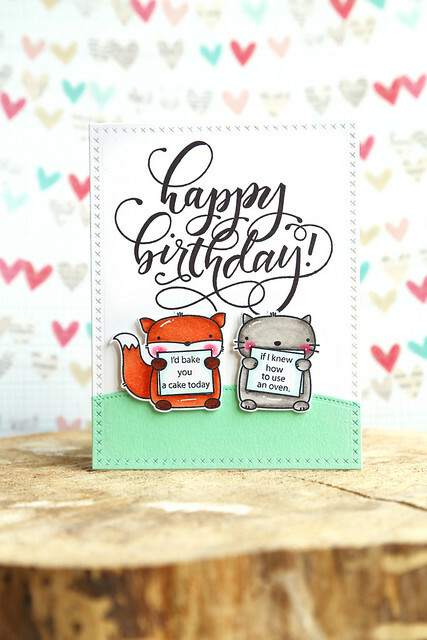 Lawn Fawn's August inspiration week is wrapping up with a look at Holiday Party Animal, the companion set to the original Party Animal(s). 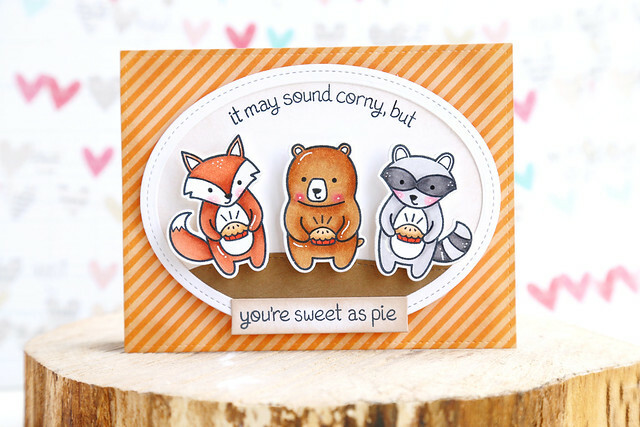 I stamped the 3 party-ready-critters with a pie each, and paired them with the sentiment from Happy Feast. 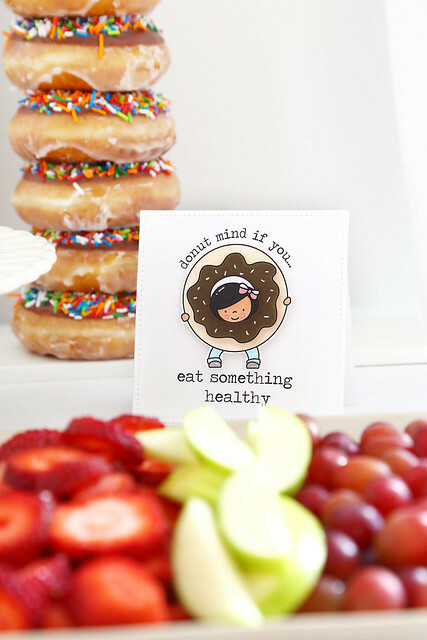 I curved the first part of the sentiment so that it followed the curve of my oval die-cut, and added the latter part on a straight piece of kraft cardstock. I keep adding frames to my cards! I usually batch-craft my cards for the month, and I guess that's what happens. I like something on one card, so I'll add it in a different-but-same way on another. I think adding the oval frame gives the card a more tailored look. 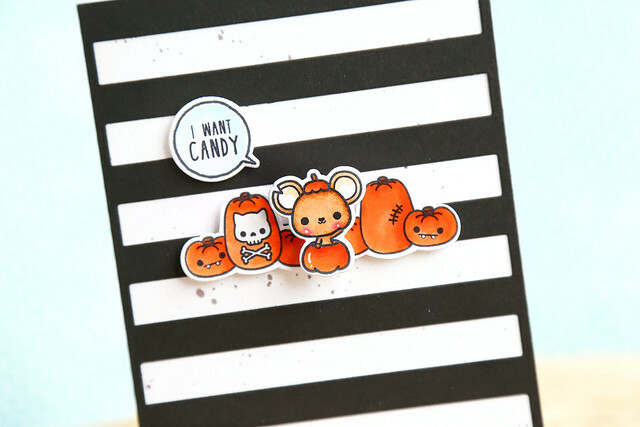 The striped tone-on-tone orange paper that I used for the background is fall perfection, no? I love the new Polka in the Dark paper collection. Stripes and polka dots in all the fall colors! I hope you like it! This is my favorite card this month, and now I wanna bake some pies! Hi there! 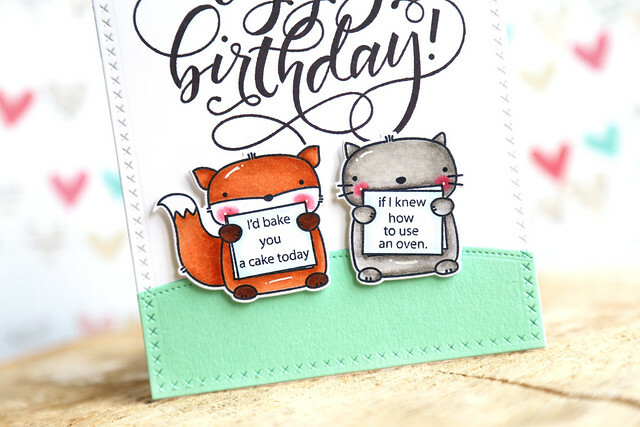 It's another day of Lawn Fawn's August inspiration week! Today, we're showing off new papers - the Polka in the Dark collection. 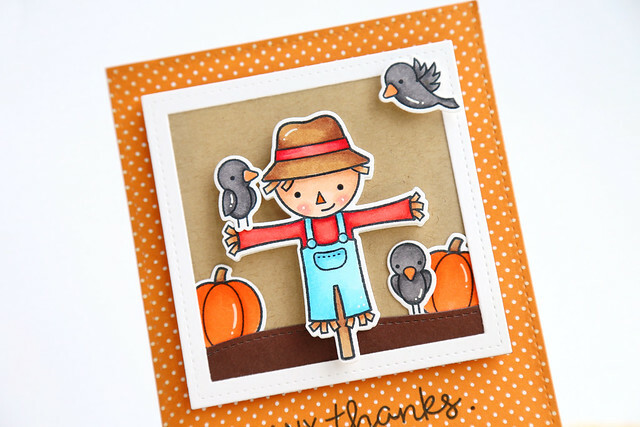 I combined a polka paper with images from Happy Harvest, to create a card with a fall color palette. That scarecrow is too cute for words. 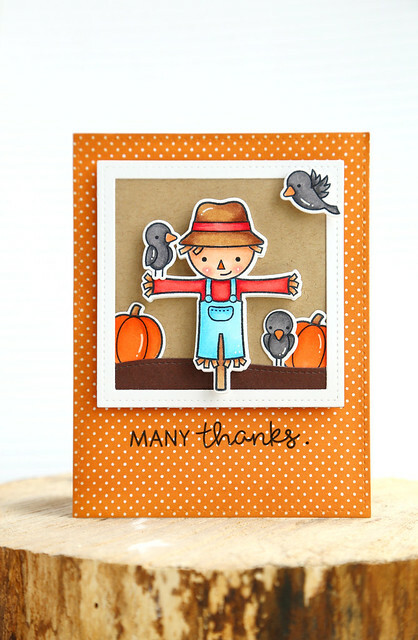 I created a little scene, adding scarecrows around him and a few pumpkin accents. I then framed everything out using stitched square dies, and popped it onto an orange and white polka dot base. 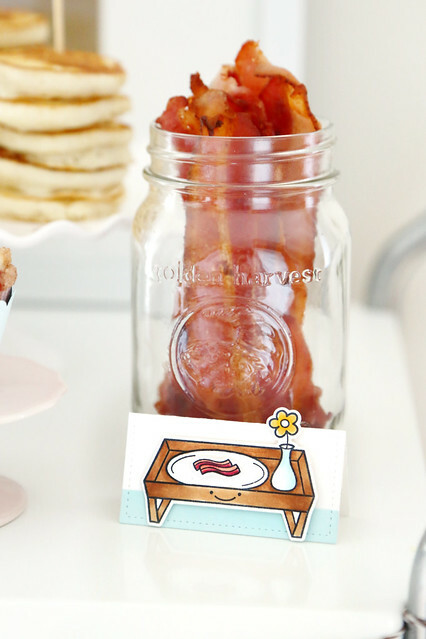 Hi there, and welcome back to another day of Lawn Fawn's August inspiration week. Today, we're showing off the mini set, Thankful Mice. They have so much to be thankful for! I masked and masked blocks of cheese to give them a huge mountain of the yellow stuff. I hope they like mild cheddar. My 5 year old was asking why I didn't color any blocks to look like the marble cheese she loves. The pilgrim mice are so cute! I love their little hats. I used stitched rectangle dies, ocean wave dies, and stitched border dies to dress up the card. 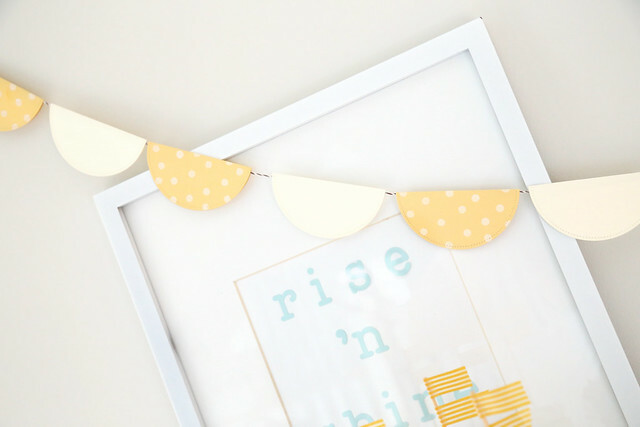 Visit the lawn fawn blog this morning to see what the rest of the team created - click! Welcome back to the last day of Mama Elephant stamp highlights for this month! 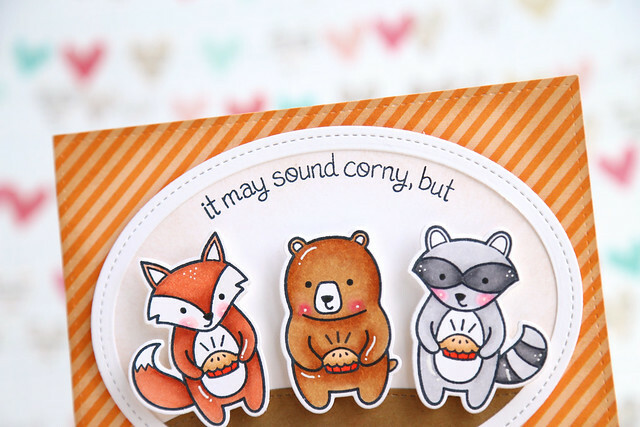 We're showing off the new sentiment set, Heartfelt Wishes. 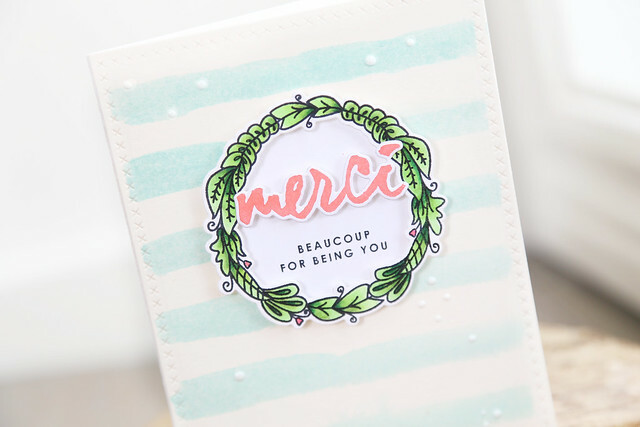 I am beyond thrilled to have a gorgeous brush script "merci" stamp - I needed it like crazy, living in Montreal and making all of those teacher thank you cards! I popped the wreath onto a circle die-cut, stamped the smaller greeting inside, and adhered the bigger script sentiment to it. That alone would make for a beautiful tag! For the card base, I used the new striped cover plate as a stencil to watercolor blue stripes onto a piece of watercolor paper. I love that the stripes look freehanded, but they are perfectly spaced out. I will definitely be doing this again! Hi there! It's the first day of Lawn Fawn's fall & winter release inspiration week. 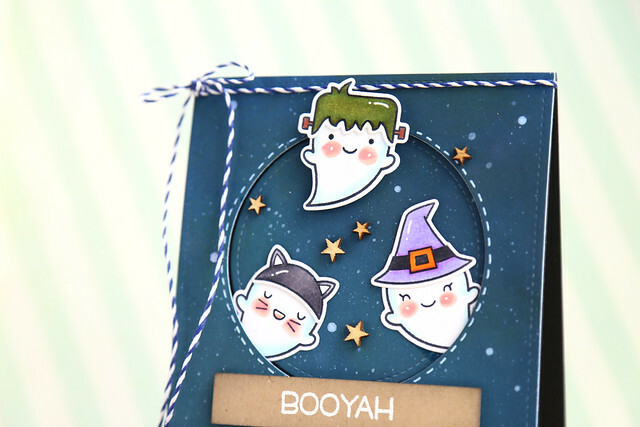 We're showing off the new ghostly, but never scary set, Booyah. I can't stop with the cute, you guys. I mean, I put rosy cheeks on ghosts. I started out with a piece of white cardstock, and grabbed all of the blue/navy/black inks in my collection, from all different manufacturers, and just started blending them until I was happy with the night sky color. 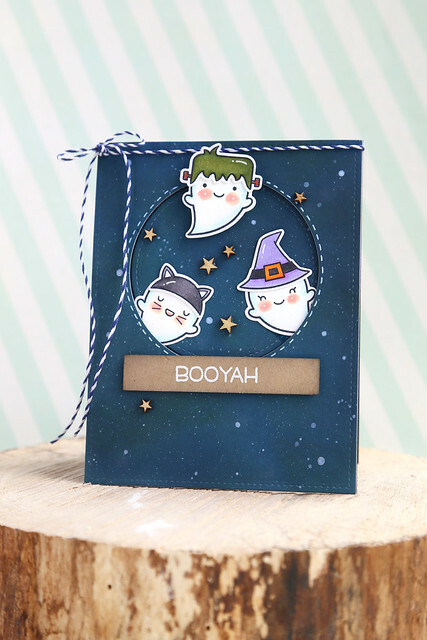 Then, when the card base was dry, I splattered white ink over it, to make it look all starry. 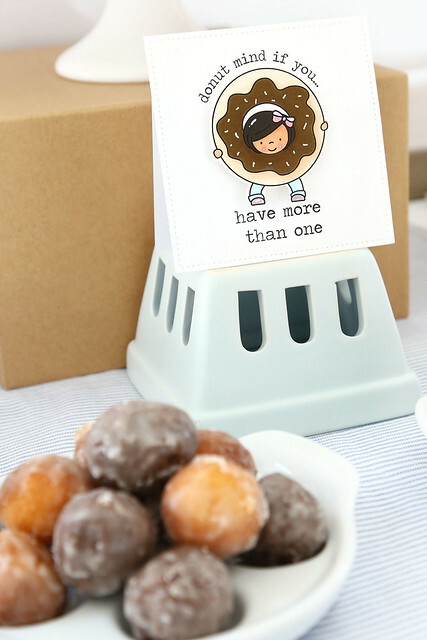 I wanted to add some dimension to the card, so I grabbed a circle die and cut into the navy panel. I propped up everything but the circle on very thin foam squares. Just enough space to wiggle in a few ghosts so it looks like they are floating out of a wormhole. Aren't the ghosts adorable? I love the different accessories - the Frankenstein hair, the witch's hat, and the kitty hat and whiskers. You can check out the original blog post here - click! 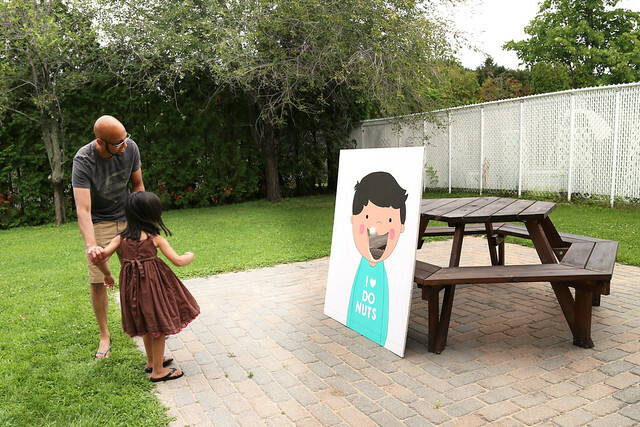 And Kelly Marie liked that card so much that she made her own version on the lawn fawn video today. Visit the LF blog to check it out - click! this card is a total lie. I know my way around an oven. if i'm being honest, though, this isn't the first time i've tried to play off laziness by pretending to be cute/dumb. who, me? i have no idea how to do that. ask someone else. The Mama Elephant design team is showing off the new set, Birthday Wishes. It comes with the big, bold happy birthday script you see above, and so many quirky subtext sentiments. I love that giant script, and how it fills up the front of the card! The second sentiment was cut up (and by cut up, I mean, cut up. every line.) and stamped into the critters' message boards. They are from the Three Amigos set. I love that they look almost sheepish about it. Who, me? Dunno how. Ask someone else. But happy birthday! Hi there, and welcome back to another day of Mama Elephant stamp highlights! 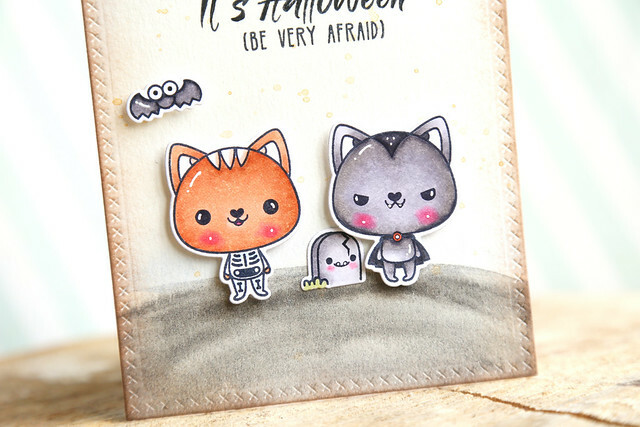 Today, we're showing off the companion set to Meowlloween, called Meowlloween Extras. They made it easy for you to know that the 2 go together - wink. There is a ghost kitty, and a toilet-papered kitty in the set, but I went straight for the mouse. I stamped, colored and cut out my favorite of the 3 mice, and propped him in front of a row of pumpkins. The pumpkins were borrowed from the original Meowlloween set, complete with the little faces and that kitty skeleton. This is definitely a no-kitty-zone! I colored everything in halloween orange, and used the new striped cover plate to feature classic black and white stripes in the background. Hi there! 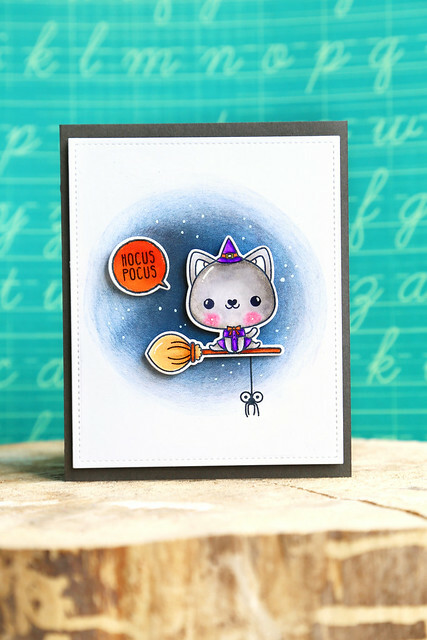 The Mama Elephant team is showing off new stamps this week, starting with the kitty-cute-halloween set, Meowlloween. 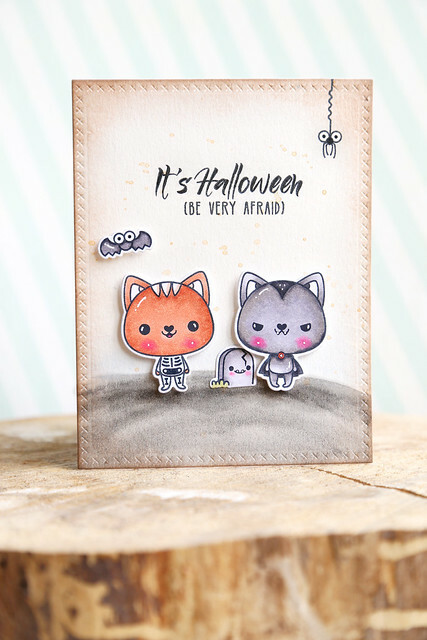 Once I stamped the kitty and her broom together, I used the partial die-cut technique to cut them out together, and propped them up on foam squares, with a spider dangling underneath. 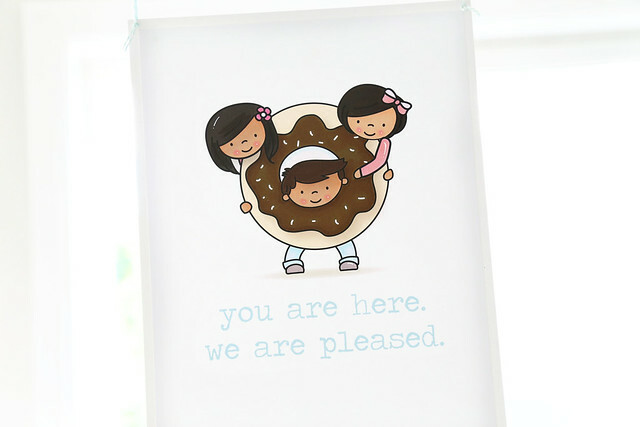 Every month, I stage a little party at home for Lawn Fawn, but I try to make it so that it's a surprise for my kids. Last month, I welcomed them home from camp with a watermelon party. 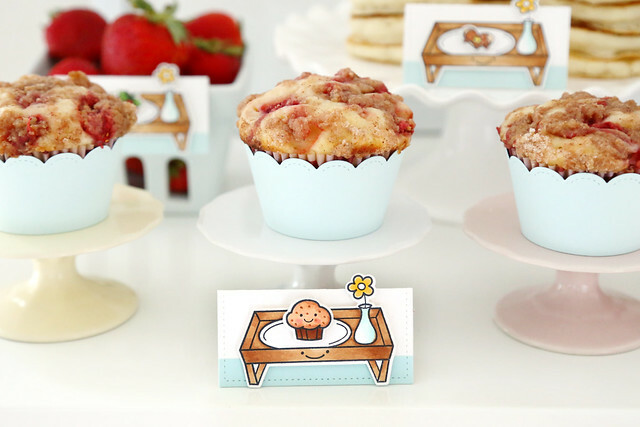 I used Lawn Fawn's Love 'n Breakfast stamp set to make the little food markers, and let the images describe what each one was for. 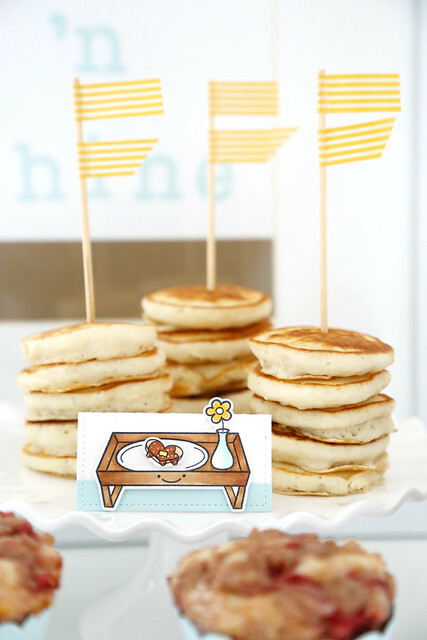 I kept it casual with washi-tape flags, and hand-drew the little pat of butter and syrup onto the pancake image. 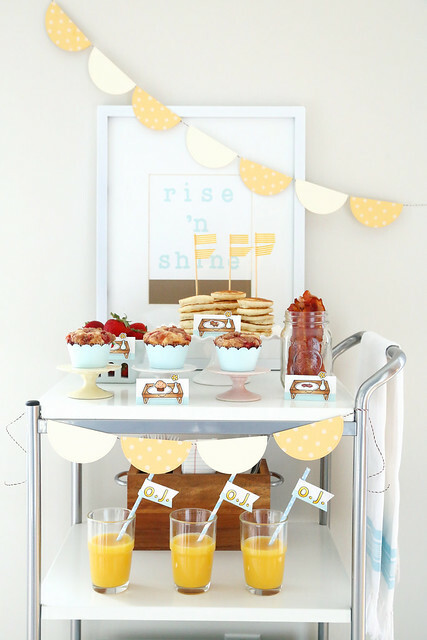 I love that smiley breakfast tray! The muffin looks a little sick. whoops! 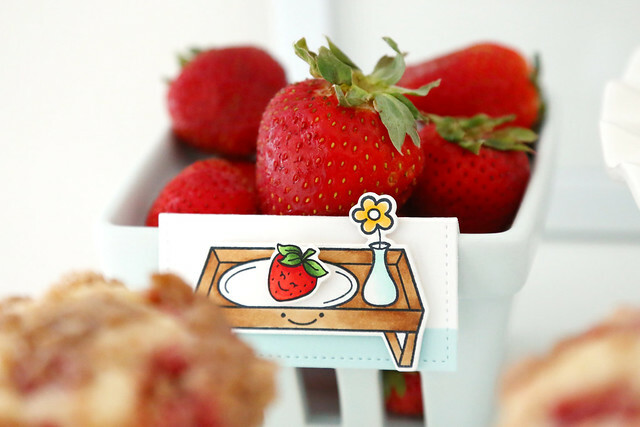 The little dots all over his face were meant to match the crumble topping on the strawberry muffins. Speaking of strawberries... I couldn't find an image in the right size for this party so I drew one from scratch. I'm hoping it blends with the rest, especially since I used one of the faces from Sweet Smiles. 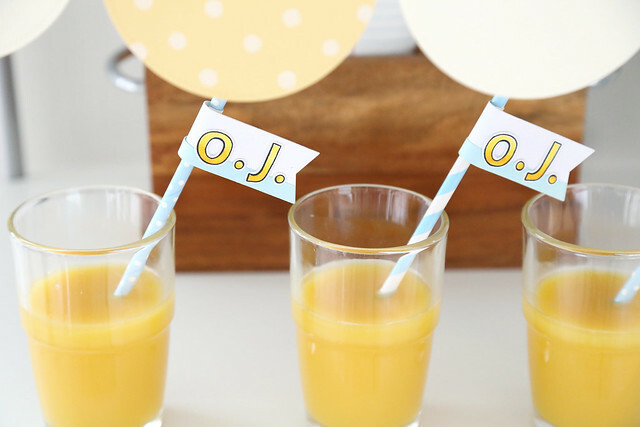 I thought using Quinn's ABCs for the juice flags made it pretty obvious, but the kids were like "what's O? J?" Don't worry, they felt pretty sheepish when I explained it. ha. I hope you like it! I love using my stamping stuff to make my kidlets feel special and loved. Made you jump out of your seat, didn't it! No? Not even the kind-of-bearded-vampire? I watercolored a cemetery ground, and added the cutie images over-top. This card was so fun to put together! 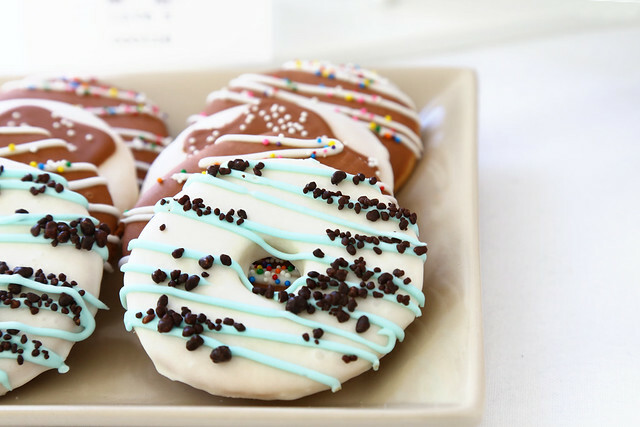 I know the donut theme has been around for awhile, but I hope you're not sick of it yet! If you're a regular here, you know that my 3 kids have their birthdays super close together. All 3 of them within 10 days of each other, in late April/early May. I usually do a party for each of them, spanning 3 weekends. This year, we were in the middle of house-packing/house-renovating stress and I nixed a party where the kids would have to maneuver around boxes, and asked if they could please pick a theme that would work for all three of them. Lemme tell you something: asking 3 kids, ages 10, 8 and 5, to agree on a party theme is no easy task. 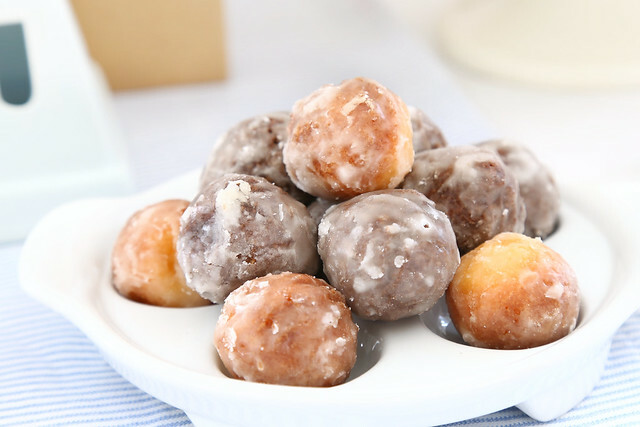 As soon as the word "donuts" was uttered, I RAN to Michaels, bought a donut pan and told them the negotiations were over. Because, look! I bought a pan. After the pan, I decided that I wouldn't use stamps for this party. I designed all of the artwork, which I'll highlight even more in a separate post, and had everything printed. 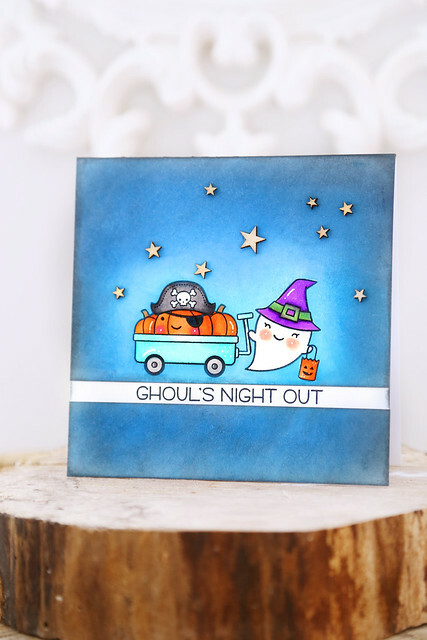 As much as I adore working with stamped images, this was even more fun! Add in all of the amazing treats by Marlyn (of Montreal Confections) and I think this turned out to be a great party. 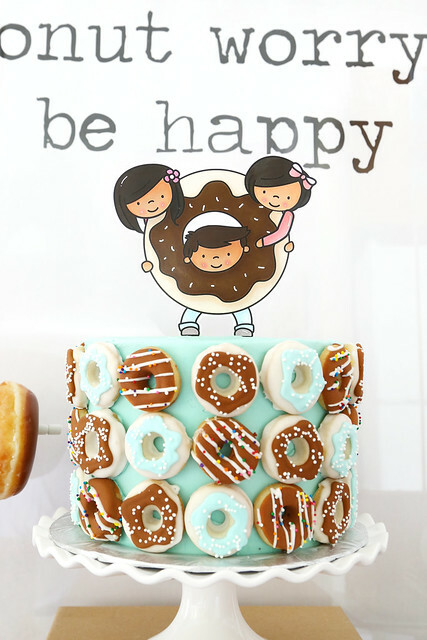 Donut worry, be happy! 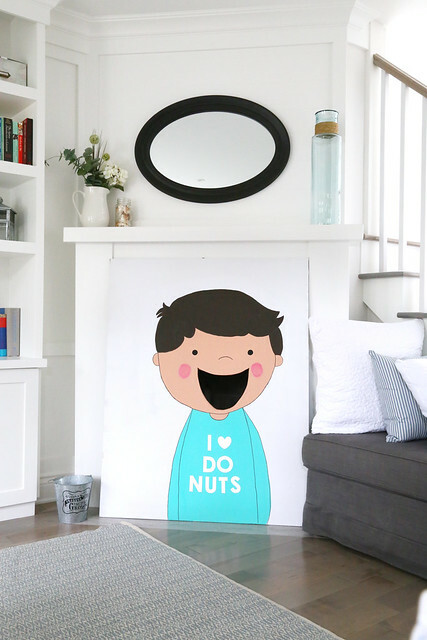 I grabbed that frame (from Michaels) from our basement, and had my artwork printed up BIG (24x36 inches). Did you know that to print that in color would have costed more than 30$, but if you print it in black and white on engineering paper, it costed under 5$? I added the color with acrylic paints that I had lying around. A cake covered in sprinkles delighted Maia to no end. She was all about it. 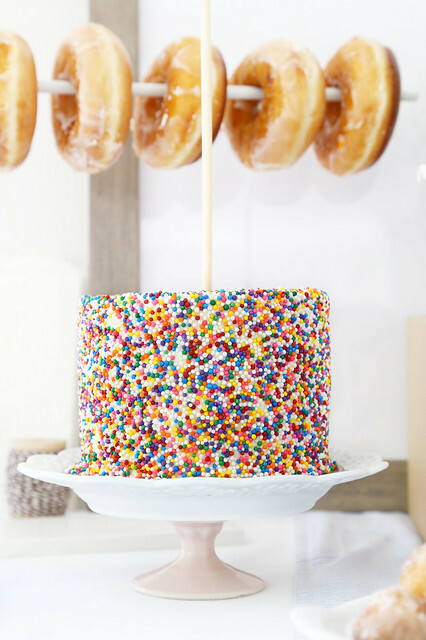 What 5 year old wouldn't be over-the-moon about all those sprinkles? 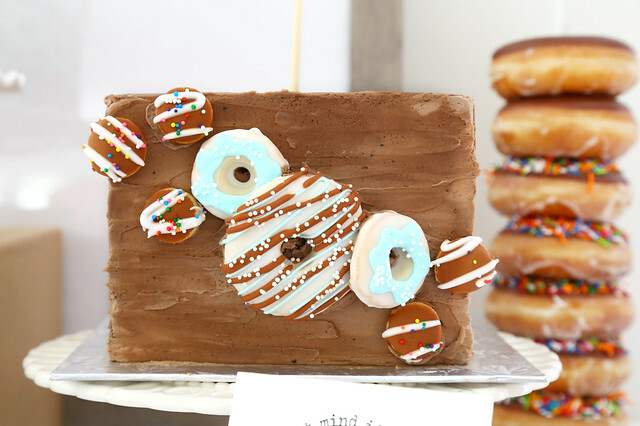 This square cake, with the donut cookies on it, was such a show-stopper. 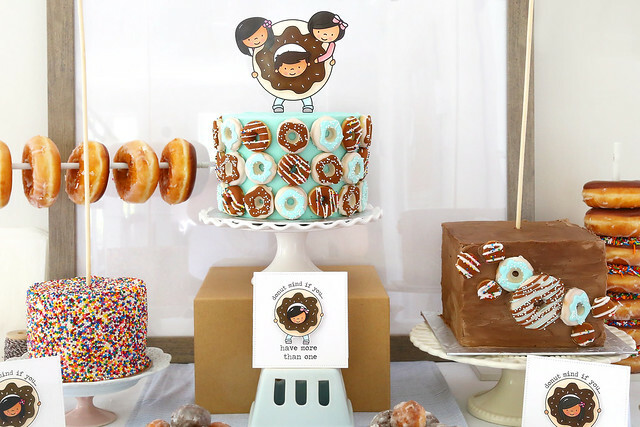 All the parents were bent over the cakes, to get closer looks at the tiny donuts! This one was my favorite. 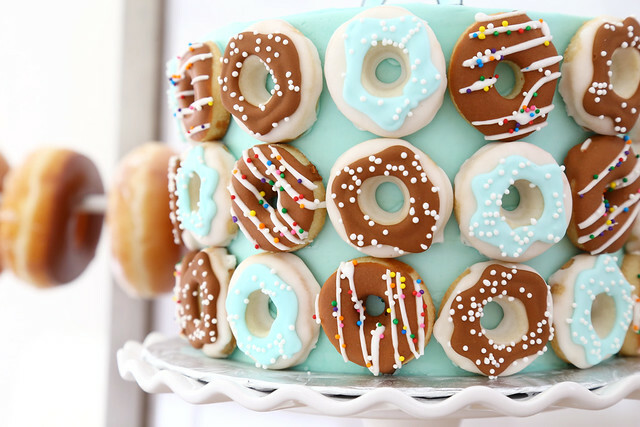 Tiny donuts all around, with minty green frosting. So cute I can't stand it. 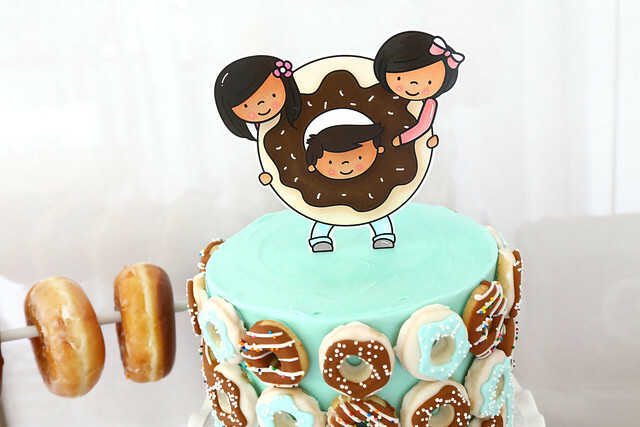 And, with my 3 kids-in-a-donut on top, even cuter. 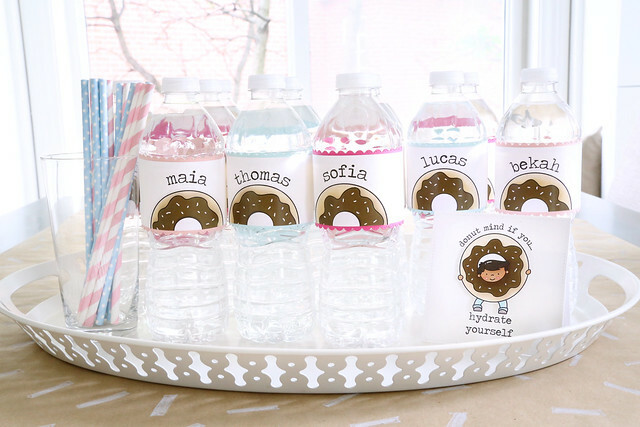 I had so much fun with the paperie for this party. 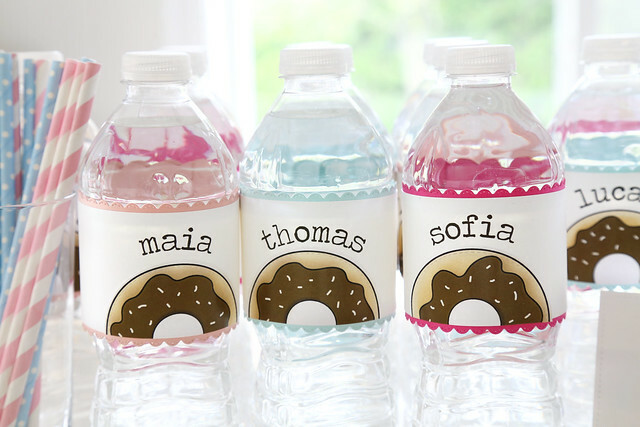 "Donut mind if you..." on every food/drink marker made the kids giggle. I felt obliged to put something on the table so that the parents wouldn't freak out over all the sugar I was feeding their kids! Do you think any of them reached for fruit? Ha, nope. 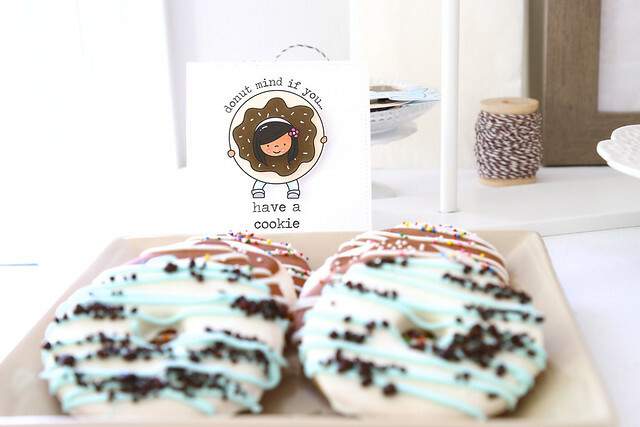 Marlyn also made the cutest donut cookies. 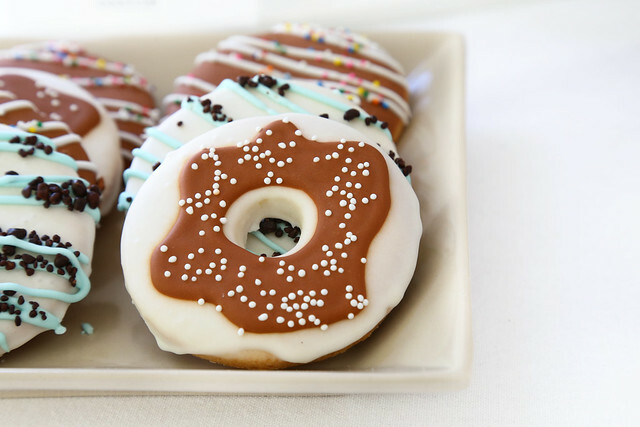 I asked her to make them as big as the donuts! 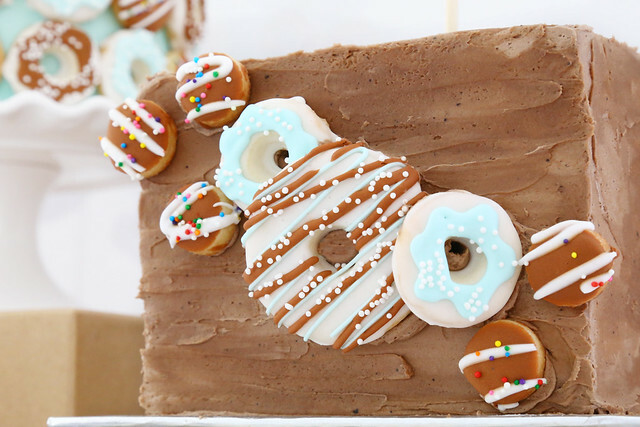 This one featured chocolate-covered-pop-rocks as sprinkles. I heard they were delicious. Ha. I had this one instead. Something happened when I grew up, and I hate all the candy I loved as a child. I mean, bubble-gum ice cream? No thanks. 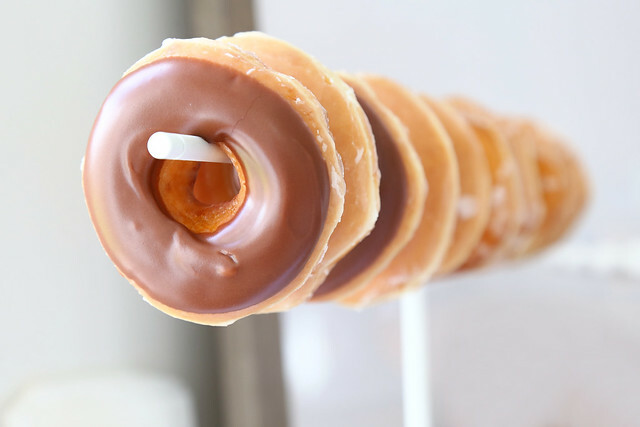 I'll have the salted caramel with pecans, please. I hung it from the dining room fixture, over the water-bottles. I sketched him out, and the hubs cut out the mouth. I used acrylic paints to color him in, and a sharpie to add the black outline. We had such a great time, and the kids would like to do a summer party with all of their friends again next year! 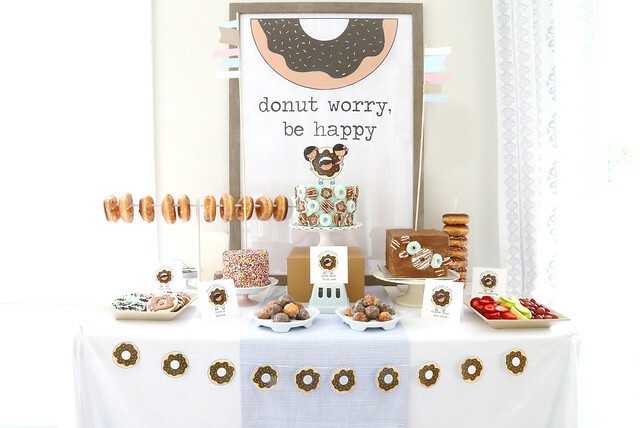 I hope you enjoyed this look at our donut party!